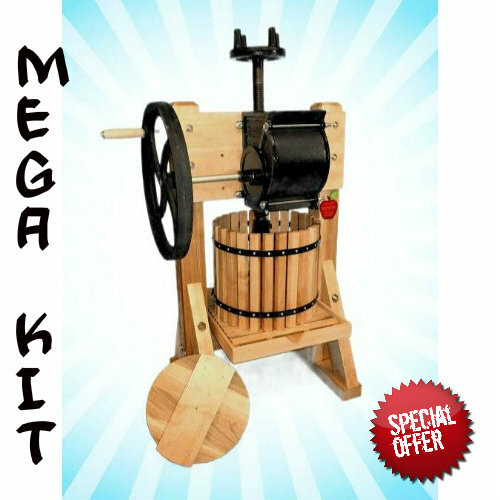 MEGA KIT includes Homesteader Press & Grinder, Motor Kit, Retractable Wheel kit, Petro-Gel lubricant, Pint of EZ-DO wood prep and THREE pressing bags! Single tub unit with all the features of our top model! All the same features of our top-of-the-line double tub press in a single tub unit! Same basic frame and press screw assembly! Great all-purpose unit that grinds and squeezes apples, grapes and other fruits and veggies. The most popular feature of the Press & Grinder is the powerful "Apple Eater" grinding attachment that is easily mounted and unmounted for using separately. Apples are pressed and ground at the same time! The Apple Eater comes mounted on the back of the press so that the pulped fruit fall directly into the tub for squeezing. Rugged design will last for many, many years! Rugged designed made of laminated hardwood and reinforced, dadoed & cross-bolted joints. Unit is unfinished for your varnishing and lacquer desires. The Acme-threaded screw is 1 1/2" diameter and 22" long. It passes through the heavy cast iron cross-arm. It features a four prong top so turning is easy! Built in the USA! Easy to use! Pressure is applied to a heavy duty press-disc. Tub is beveled for easy cleaning of staves. Grinder features polymer cylinder that prevents growth of bacteria. Cast iron grinding box. Sturdy unit designed to handle usage for decades!